"I think that noise was due in large part to misconception," says Denis Dyack. "I guess it's safe to say there's always been noise around me," says Denis Dyack of Precursor, late of Silicon Knights. Precursor's Shadow of the Eternals crowdfunding efforts did not go well at all, a performance that Dyack blames on "misconceptions" about both him and his former studio, Silicon Knights. Precursor has nothing to do with Silicon Knights, he insists. "We're working on getting over that," he says. Precursor Games' Chief Operating Officer Shawn Jackson added that, in his estimation, Precursor's crowdfunding being released at around the same time the new studio was created - when who worked at Precursor and where it got its stuff from was a hot topic - was an error. 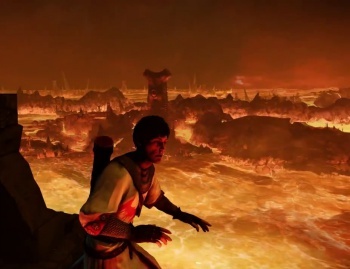 Educating the consumer should have been Precursor's focus, but instead it - and Dyack - spent time trying to put out old fires. It distracted from the game, and its crowdfunding suffered as a result. "I think, ultimately, that was a mistake on our part," Jackson said. Shadow of the Eternals will return to Kickstarter at some point, Precursor claims, probably with a lower ask. But if you were hoping to know when that would happen, Precursor isn't about to say.